Love love love- the detailing of the cupcake earring and the mystery surrounding the serial dieter on the cover just leads into the inside pages. I am super engrossed and hooked as the secrets unravel with each chapter. What an honest, fun and real read! 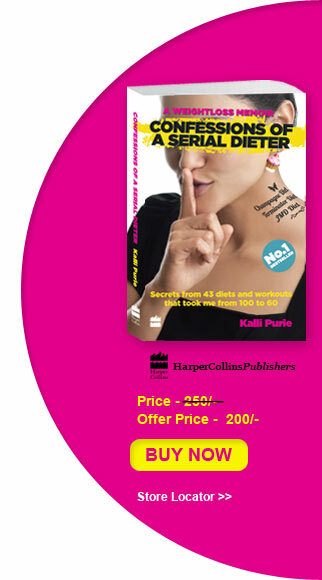 If u wish to lose weight n be fit read Confessions of a Serial Dieter. I ve seen Kalli lose 40 kgs. She walks the talk. Book is so beautifully written and it's more a love story than a diet book. It has such funny undertones. Its like I am chatting with my girlfriend. Confessions is unlike normal diet books it is not instructional, its experiential. Presenting this book to someone is the nicest way to say I love you, but your are fat! Thank you for the book as reading the first few pages motivated me to hit the gym after almost 2 months! And your book will reach international shores by tomorrow as sending it to my sis in Singapore who wanted one after she looked at the website.. Your diet book is making me want to eat! Its excellently written. Very well done. Love the book its funny witty racy. Going back to it. Bye bye! I did not go out for dinner and had a night in with my new girl friend Confessions of Serial Dieter. Easy, fun and REAL. It's kickass! Get two copies. Domestic violence in my house over it! Your book has been incredibly inspirational. God bless! Harry Porter of weightloss. The way she has lost weight is MAGICAL! This book is entertainment, entertainment, entertainment! What a book. Kudos to anyone who says it like it is w/o sugar (free, if I may add) coating it! You write like a dream! Just picked up your book a few days ago, and today I start my diet! Its the best freaking diet book i've ever read. And who knew you'd be so funny too! Rich. Thin. Funny. Beautiful. Chocolate lover. You really do have it all. First book and a bestseller! Fun to read and packed cover to cover with 'everything you always wanted to know about dieting and didn't know who to ask'. Madam, count me in as your serial admirer for life! I am laughing my pants off reading this book… I laughed so loud I woke up my neighbour on the deck chair who was enjoying her afternoon siesta. This book is so crazily funny and yet shows the insane struggle that goes into losing 40 kilos. This is Devaleena ,i'm a counseling psychologist based out of Kolkata ,just finished reading the book that you've written ... must say an amazingly honest narration , i know as i've been through it myself ...very thought provoking . Just wanted to congratulate you on the book launch. A very nice and candid way of portraying an otherwise very boring topic of weight loss ! You used to look like a puri, now u look like kalli! I wish your book finds many friends, and how brave of you to write it. Congratulations: for your courage, and clarity of intent. Read you book. It was “unputdownable” , outstanding. It was really refreshing with an excellent conversation style. Such a wonderful and motivating read! Congratulations! You've hit the nail on the head. What a fab book. I've been a serial dieter for a few years now and everything you said just resonated so much with me. Love the writing, love the style and especially love the tips. I'm inspired in this new year to go for it and find a rhythm and lose the weight. Well done! "I have personally noticed the author having gone through such a spectacular change re: weight control, while she still maintaining the highest fitness standards. The results achieved by her are based on the basic principles that make a lot of sense. A MUST READ for all the really health conscious folks." Reading Confessions. Very very nice. Can relate to it so much. Just bought it yday. I think I know abt most of the dieticians mentioned. Ha ha ha!! I know the real names of most of them. She has cute and v appropriate names for them. Read two-thirds already. V interesting read and made me laugh - one laughs when one reads the truth abt feelings na. Its funny how we fat ppl feel soooo much the same stuff! Others r zapped I have read so much of the book coz I am a very slow reader - I read max 10 pages of a book a day not like u who can finish a book in a day. Woke up. . . Switched on tv to watch parade. . -Picked up Confessions to finish reading. . Just finished . . So great to start the day laughing. . She's a riot! loved reading it!. . Had to laugh into the razai so wouldn't wake hubby.